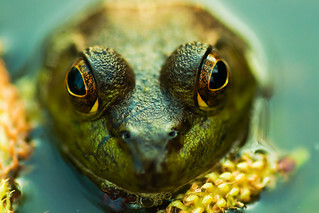 this is a macro shot of the Green frog i took couple days ago, it lives in pond mostly floating with its head above the water!! it is almost full macro reproduction n handheld n i could feel my lens tip rt on its nose. interesting thing, this was the only frog that stayed as it was, with every other frogs dipped into the water as soon as i tried to get close to them. iso speed 640, WB manual.